Click this link for tools and worksheets that I have found to be helpful for myself and clients in gaining clarity on this most core exercise of Commitment #1 - the process of considering and defining your business and personal Core Values. Additionally, below are some podcasts/videos I came across that were relevant, that may help you in thinking this all through as well. 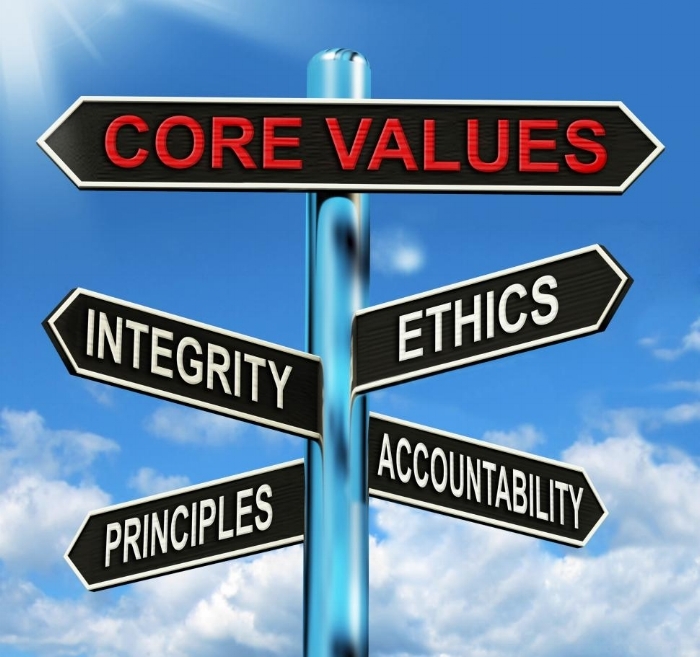 In going through this process myself I clarified that for our business, the following are our unique Core Values that define and drive us. Hopefully it helps you in your process as well. We value & reward the entrepreneurial spirit. We are always looking for ways to improve what we do & how we do it, & encourage initiative even if the idea is not used or successful. We'll never do something "Just because that's the way we've always done it" or say "Now we've got it all figured out." In our clients we look for the entrepreneurial spirit as well. They don't need to be business owners, but they have a strong desire to improve their life situation & a willingness to put in the effort & planning necessary. We value the freedom to be independent. We are not required to use any specific company or financial solutions in our client recommendations. We also design the company with efficient systems to serve our clients effectively while still thriving in the other areas of our lives & having the freedom to enjoy those. For our clients, Freedom is the focus of our conversations - to design the life you dream of & the systems to move you that direction. "Phase Four" refers to financial freedom where recurring revenue sources exceed expenses, & also encompasses overall freedom in your life beyond just finances. We recognize the importance of involving other people in our lives & business. From our financial services relationships to our extended client service team, we are most effective in serving our clients when we have strong relationships with people who have complementary expertise & the same heart to see our clients achieve successful outcomes. For our clients, we view our relationship with you as a partnership. Knowing that no one cares more about your success in life than you, we will come along side you & share our insights, resources, & encouragement to help you on your path to accomplishing the most important things in your life. We see a fulfilling of our purpose in being alive to help our clients explore, pursue, & fund the most important dreams & goals that they want their lives to be all about. For our clients, we connect well with people who are not content to just make it through life & eke their way into retirement just to fade into a life of irrelevance. Our clients tend to have strong purpose & meaning around their motivations to make the decisions necessary to plan their lives & finances effectively.